Although the word sohei is usually translated as warrior monks, the hei part fits “soldier” much better. These are monk-soldiers, but as English has no such term, warrior monks will generally do. 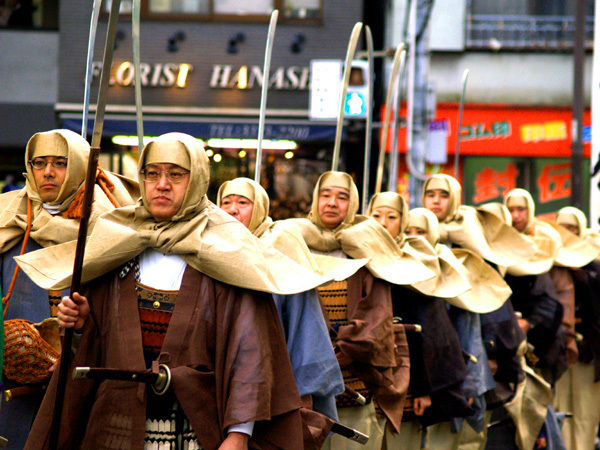 The image above is a procession in sohei costume; as a serious armed group, the sohei met their end long before the samurai did. The sohei existed because of an astonishingly simple question. What force on Earth had the authority to tell Buddhist monks what to do? To Japan, Buddhism was an imported religion. It existed in multiple sects. No one had ever established that they answered to the Japanese Emperor; at any rate, the rise of the samurai had eroded the Emperor’s secular authority centuries before the sohei stormed onto the scene. If two Buddhist sects had a dispute, who would settle it for them? No one. If two Buddhist sects had a dispute that became an armed confrontation, who would fight for them? No one. If two Buddhist sects fought in the open, who would interfere to prevent the stronger side from winning? No one. This situation, a product of the same social and political upheavals that produced the rule of the Shogun and a hardening of the role of the samurai, produced the sohei. Sohei were instantly recognizable because of the white cowls they wore over their heads (which were shaved, like all monks). Otherwise, they were armed much like samurai, right down to steel helmets under the cowls. In other words, they were armed according to the prevailing conditions of their day. Thinking of them as temple samurai would not be an exaggeration. Some might recoil at the whole idea, but Buddhism would never have thrived in Japan if people had interpreted it as a religion of pure pacifism. Besides, if you’re on a holy crusade, a lot of what might otherwise be condemned as unnecessary violence suddenly becomes necessary violence. The point being, sohei co-existed with samurai during the same period. It isn’t much of a stretch to say that they recruited from a lot of the same talent pools. Thanks to their holy status, and their all too temporal might, the temples became forces unto themselves. If they had not, these temples, often centers of local or even regional commerce and, even if this was disregarded, sources of money due to visits by pious pilgrims, would find themselves at the mercy of others, to be exploited or simply plundered at will. Thanks to the sohei, this was not the case – to the point that these groups came to be considered a threat to the warlords of Japan. 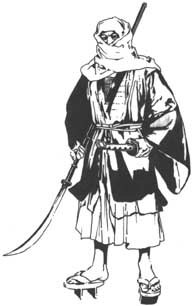 Like samurai, sohei used katana and tanto (the latter being reinforced daggers capable of penetrating armor, a standard samurai back-up weapon throughout their history). Also like samurai, they included a considerable number of skilled archers, for otherwise they would have difficulty defending high places. In addition, they wore armor that was virtually indistinguishable from the samurai yoroi (armor) of the day, except for the white cowls. Unlike the samurai, sohei became known as particularly heavy users of the naginata, a polearm with a wooden shaft and a slightly curved blade. This made the weapon useful both as a swinging weapon, with greater reach than than the katana, and as a thrusting weapon, used in packed formations. Thus, it was ideal as a weapon for defense and counter-attack on temple grounds, allowing a single man to attempt to hold a doorway, but also allowing a packed formation to swiftly go on the assault. Sohei often carried a portable shrine, or mikoshi, with them on campaigns. Committing violence in the presence of such a holy object was considered blasphemous… though certain warlords could have cared less, seeing armed monks as blasphemy in and of itself. At any rate, this served as protection from ordinary soldiers, not rival sohei with their own rival divine beliefs (and carrying their own mikoshi). In the 10th century, the Emperor and his government still retained a great deal of power. This power included the authority to appoint which monk would run a particular temple. However, the factional divisions within Buddhist monks and the simple realities of palace politics meant that a member of one faction could be appointed as the head of a temple controlled by a rival faction. This, of course, did not go down very well. Protests began. Eventually, there were protests of this nature which ended in brawls in the streets, accompanied by fatalities. 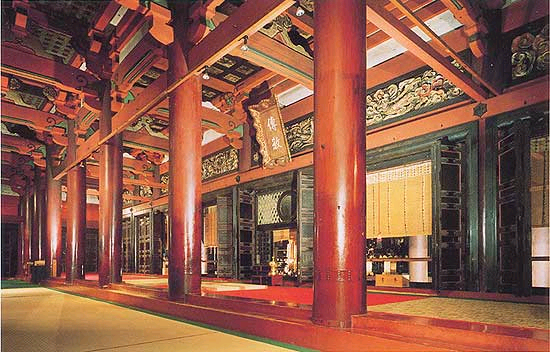 A dispute between two shrines led to the establishment of a standing army of monks at the Yasaka Shrine in Kyoto. This led to a warrior monk arms race, if you will, as disputes over appointments, and the personal honor of the leaders of various religious complexes, broke out into limited armed conflict. These disputes expanded at times, but at others, were prone to long periods of complete peace. Nonetheless, new grievances arose and once again, even larger armies of sohei dueled with each other. Finally, in 1121, the Mii-dera complex was burned to the ground by monks from Enryaku-ji. (And in 1141, they came back and did it again!) Other temples became embroiled into conflicts, and the Mii-dera and Enryaku-ji rivals joined forces against other powerful temples. Sohei were combatants on both sides of the “Genpei” civil conflict. Thus, monks who would have gladly fought for themselves were fighting rivals working for the other side. The temples of losing factions were burned to the ground in retaliation for defiance. Overall, these stories were footnotes as part of the grander conflict that produced the shogunate. The 13th and 14th centuries were as good as it got for sohei. Though they first had to rebuild, physically as well as politically, the mere existence of the sohei helped the temples get what they wanted from the shogunate without violence. Furthermore, they were able to stay largely aloof during other civil disputes of the time. This meant they could husband their economic and military resources and remain bastions of power, untamed by secular forces, and simply not worth the trouble to humble. Put another way, deliberate attempts to use appointments to debilitate strongly established factions tapered off. There was less need to protest, and less reason to fight each other. Notwithstanding this, the rise of Zen, and the support given to Zen by the Ashikaga shogunate, gave rise to new conflicts, with the established temples seeking to defend their power and influence from the upstarts. In the mid-15th century, a weak Shogun without a son, and with one eye on retirement, dragged his younger brother out of monastic life and declared him heir. A year later, his wife gave birth to a son. Surprise! Well, it wasn’t very funny. Declaring his son to be the heir, the Shogun might as well have made a written invitation to every power base in Japan to line up and pick sides and fight it out. With this, the long period of relative peace and neutrality came to an end. Within thirty years, the Ikko-Ikki movement arose in the countryside. The name itself broadcasts that these are coalitions of like-minded people, and they didn’t like what was going on. Daimyo? Shoguns? Samurai? To hell with all of them. These people were sick and tired of being piñatas in an increasingly lawless era, so they armed themselves with weapons, both physical and spiritual. Spiritually, they were armed with Pure Land Buddhism, which is the dominant form today. So, essentially, just pray to Buddha – a lot – and he’ll come save you. That’s it. No wonder it got popular. From this point on, these new sohei fought in the Ikko-Ikki extensively against every other faction trying to make headway towards a united Japan under their rule (as opposed to someone else’s). Thus, the Ikko-Ikki were essentially radical people’s movements that believed in equality. In other words, they fought everyone else equally, showing no favor to any of them. As Oda Nobunaga (family name first – J) rose to power, he not only spent a very considerable amount of trouble to wipe out the Ikko-Ikki as a threat to his rule; he also found sohei from good ol’ Enryaku-ji fighting in the streets of Kyoto with a rival Buddhist sect. Then, the Enryaku-ji monks decided to ally with the Asai and Asakura families (Asakura, as in the Asakura shogunate). They picked a really bad time to ally against Nobunaga, who was reaching the height of his power and who has been considered one of Japan’s cruelest warlords, perhaps for what he did next: he took an army of 30,000, surrounded Mt. Hiei, and destroyed Enryaku-ji, putting every man, woman, and child to the sword. The temple was rebuilt, but the sohei were not. Nobunaga spent years exterminating the Ikko-Ikki and their component sohei before his own fiery death. In the decades to come, they would pick rival sides in the battles to unify Japan. Finally, the victory of Tokugawa Ieyasu – who knew all too well how the sohei were a threat to his ideal of a united, peaceful Japan – made clear that they would no longer be tolerated, and there was no longer any prospect of picking another side. Thus, the sohei were re-absorbed into the fabric of history, and became a memory. The sohei were, in some sense, an accident of history: a samurai-ization of monks that occurred because of the conditions in Japan at the time, the enduring idea that justified violence was not unholy, and the simple belief that they were necessary. Given the level of armaments in Japanese society in general, the temples relied on their own might to defend their property, lives, and beliefs. I find this self-reliance to be admirable. It shows a lack of denial about their human natures. They did what they felt had to be done, and that was all. I cannot and will not condemn that just because it does not fit into a perfectionist view of Buddhism. We’re not perfect, and it’s fine to accept that and live with it. Having said this, they had no special claim on violence. Going toe to toe with the likes of Nobunaga meant risking getting burned… and burned, they were. They knew what they were doing and thought the Asakura would regain their former glory or, at any rate, would be able to keep Nobunaga out of Kyoto. They simply lost that bet, and paid for it. Since even this did not end the sohei, their being brought to an end, like the Ikko-Ikki and, centuries later, the samurai themselves, was a stepping stone to a unified Japan. That’s not, actually, to say it is a good thing or a bad thing. It just is. They played a role; that role became obsolete; now they exist only as part of ceremony. Actually, the most we see of sohei these days is in role-playing games. In my case, it was a video game, but there is a sohei class in Dungeons & Dragons books of old. So the idea lives on. This entry was posted in Culture, Japan and tagged culture, history, Japan, jidai, mikoshi, monk, naginata, sohei, warrior. Bookmark the permalink. There is a picture of a samurai warriors hat on the right side of your page. Japanese warrior monks were not samurai and did wear these kinds of hats. The “yamabushi”, like Benkei wore a black pointed hat. Samurai warriors were a sect unto themselves they were not monks, or renegade monks who left the monastery, but came from ancestors who were samurai, owned land, and some wealth. Take out the picture or clarify it. I will not. That was a graphic created for me by a friend as a thumbnail for use on social networks. It is NOT part of the post; it is part of the sidebar that appears on the page at all times. Within the post, I have written, “In addition, they wore armor that was virtually indistinguishable from the samurai yoroi (armor) of the day, except for the white cowls.” I did not assume readers would presume this meant you can’t wear a cowl over a helmet. As this is a blog and not a professional encyclopedia, I have to make some compromises for brevity. That’s the only area you can claim that is unclear. The image is outside the post area. I did the best I could, but your arbitrary directive is, at present, misguided, so I cannot permit myself to blithely follow it. Thank you for your comment. To call a “kabuto” as simply a Samurai hat is disrespectful. The head armor of a “Bushi” is more elaborate than being called a hat. It symbolizes the leadership and service as exemplified by “Bushido”. Especially if paired with a matching “mengu” (face armor) consisting of either a “somen” (full face mask), a “happuri” (forehead & cheek armor), a “mempo” (nose to chin armor), a hanbo (mouth to chin armor). And then there’s the “yodare-kake” (neck/throat guard). Similar to the Jedi Knights of Star Wars, they are the protectors of justice. And so they must also be protected to continue their service to their “daimyo”. But I get what your anonymous reader wanted to say. A samurai wears a kabuto while a sohei wears a white cowl with no head armor underneath. ADDENDUM: I also don’t think they wear a “mengu” (face armor) underneath the white cowl. They don’t have that much money for those things. As for their preference in using a “naginata” as compared to a “daito katana” (katana – single bladed sword; shaku – 11 to 12 inches; tanto katana – less than 1 shaku; shoto katana [either longer wakizashi or shorter kodachi] – 1 to 2 shaku; daito katana – 2 to 3 shaku; nodachi katana – 3 to 4 shaku; commonly called Japanese short sword, medium sword, long sword and field sword respectively), Sohei are usually cavalry since horses are also expensive while Samurai are usually mounted on horses. So it’s easier to use a “naginata” to dismount someone high up on a horse. Hope my comments were informative to readers of your blog. ERRATUM: The size of the “katana” (Japanese sword) that I mentioned is only for the “ken” (blade) and does not include the “nakago” (tang) inside the “tsuka” (handle). It’s only from the “kissaki” (ponted end) to the “tsuba” (handle guard) and “habaki” (blade collar). And not up to the “kashira” (pommel or end of the handle). My research was very specific that Sohei did wear helmets under their cowls. I’m sure they didn’t wear the face masks… and I think you must have meant they were infantry rather than cavalry as their weapons would suggest. I hope you forgive me for not throwing “shaku” lengths around – I’m well aware of the term, but in writing a general article for an audience that may not have that level of depth yet, I didn’t want to drown people. Your details are certainly informative, and I do appreciate your pointing out that blade length is indeed “blade” length. Oh, yes. Sorry for that and thank you for the correction. Infantry it is (and not cavalry). Regarding the shaku info, it was actually for your readers that are unaware of this (since I know that you are adept in Japanese culture). I just wanted them to understand what we were talking about so that they can relate. Regarding the helmet or head armor under their cowls, I concede that your research is correct. I just wanted to differentiate a simple helmet from a fully-articulated “kabuto” of a “Bushi” with “fukigaeshi” (helmet wings) and “maedare” (family crest). I don’t think those wide & tall accessories are under those cowls. Some even have large horns and antlers. I mean theirs was not just for protection but really for a grand show so that the wearer was very identifiable even from a distance. The cowls of individual Sohei make them appear anonymous when they are grouped together. In a group of Samurais, you can identify each one from their kabuto (as well as yoroi). Again, that info is for your readers, k. I feel its always nice to share things with others which is what you did for all of us who didn’t know details about the Sohei. Thank you for that and there should be a lot more people like you. Can anyone link me to where I can find more information on the Sohei in relation to their beliefs (Buddhism is such a broad title) and how they conducted their day to day life? I’d like to recommend this book, goes a long way to debunking the myth of the Sohei as naginata-wielding, cowl-wearing soldiers. Adolphson’s research reveals how this stereotypical image is actually a Tokugawa-era form of propaganda designed to propagate the idea of ‘evil monks’, and in reality, there’s not much evidence beyond later Tokugawa-era sources to suggest that the temple monk-warriors routinely wore the head-cowl on campaign, or employed the naginata exclusively. A vaguely related question, but I’m doing research on Uesugi Kenshin, and struggling to find information on a very specific point. When he took his vows, would he have worn a white cowl over his helmet when we went into battle, or would he have dispensed with it in favour of a proper helmet with a face guard? I have found four different sets of armour online referenced as belonging to him, and they all have big helmets and face guards. I don’t know if they’re all from before he took vows, so I wonder if you have any information on that at all?